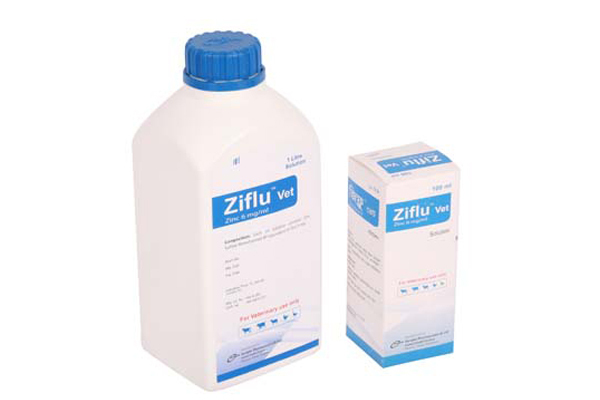 Zifluvet solution: Each ml solution contains Zinc Sulfate Monohydrate BP equivalent to Zinc 6 mg. The importance of Zinc is related to productivity & prevention of deficiency symptoms. Zinc Sulfate is a component of many enzymes such as carbonic anhydrase, alcohol dehydrogenase, alkaline phosphatase, DNA/RNA polymerase etc, which helps in metabolism of carbohydrates, proteins, lipids and nucleic acid. Zinc Sulfate is indicated for poor growth, reduced egg production and hatchability, diarrhoea, poor feathering, hyperkeratosis etc. Zinc Sulfate is indicated for inappetance, diarrhoea, poor growth, alopecia, dermatitis, delayed wound healing, parakeratosis, hyperkeratosis, malformed hoof, impaired reproduction, immunologic dysfunction, reduced production etc. Prevention: 8-10 ml daily or 1 mg/kg body wt. Treatment: 16-20 ml daily or 2 mg/kg body wt. Prevention: 17-34 ml daily or 2 mg/kg body wt. Treatment: 34-68 ml daily or 4 mg/kg body wt. By following above dose, administer once daily for 5-7 consecutive days. Well tolerated at the recommended dosage. Before using in pregnancy and lactation discuss with the registered Veterinarian.